Reliable sources report that at least six Jumma tribal people were killed, and hundreds of houses burnt to the ground, in an attack by soldiers and settlers on tribal villages in the Chittagong Hill Tracts of Bangladesh on Saturday. The attacks took place in the Sajek region, where tensions have been rising since Bengali settlers, supported by the army, have been expanding their settlements on Jumma land. 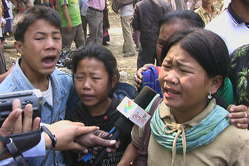 Picture (courtesy: Survival International): The children of Ms Buddhapati Chakma, who was shot dead by soldiers, speak to local journalists. Local reports state that soldiers shot indiscriminately at Jumma villagers after one soldier was injured during clashes. Many other Jummas were hurt. Settlers, aided by the security forces, set fire to, and destroyed, five villages, consisting of at least 200 houses. A Buddhist temple and a church have also been burnt down. Thousands of Jummas have fled to the jungle to escape from the soldiers and settlers. The local administration has imposed an order known as section 144, which prohibits the assembly of five or more people and the holding of public meetings. This is hampering the Jumma’s efforts to establish the whereabouts of missing people and to confirm the numbers killed. Two bullet-ridden bodies have been recovered (those of Mr Lakkhi Bijoy Chakma (40) and Ms Buddhapati Chakma (36)), but tribal leaders report that the army has removed the bodies of several other Jummas who were killed during the incident. Hundreds of thousands of settlers have been moved into the Hill Tracts over the last sixty years, in a policy supported by successive governments, displacing the eleven Jumma tribes and subjecting them to violent repression. In 1997 the government and the Jummas signed a peace accord that committed the government to removing military camps from the region and to ending the theft of Jumma land by settlers and the army. The accord offered hope, but military camps remain in the Hill Tracts and violence and land grabbing continue. Note to editors: Survival has pictures from the incident. Note to UK editors: Jumma people living in London will protest outside the Bangladesh High Commission on Wednesday 24th of February at 10 am.